The introduction of POS system not only proves to be beneficial but a blessing for the restaurant owners to run their businesses smoothly. It helps the restaurant manager to manage the various day to day activities like employee scheduling, invoicing, and managing inventories. But implementing reliable POS software for your restaurant management does not finish your task. It is essential to track the software performances and to upgrade it regularly to meet the growing business demand and to offer complete satisfaction to the customers. The POS software solution providers always tend to improve and enhance the function of the software and assuring the effectiveness and reliability of the tool. If you have not upgraded your POS software for the last 5 years then there are chances that your business is missing some of the latest and groundbreaking technologies. It is therefore very important to stay updated with the changing business needs and to empower your business by implementing the latest technology. When Should You Upgrade Your POS System? The POS system has the life expectancy of 5 to 7 years. But still, it is important to know the right time to update your POS software. But how you would be able to know the right time to upgrade your POS system. 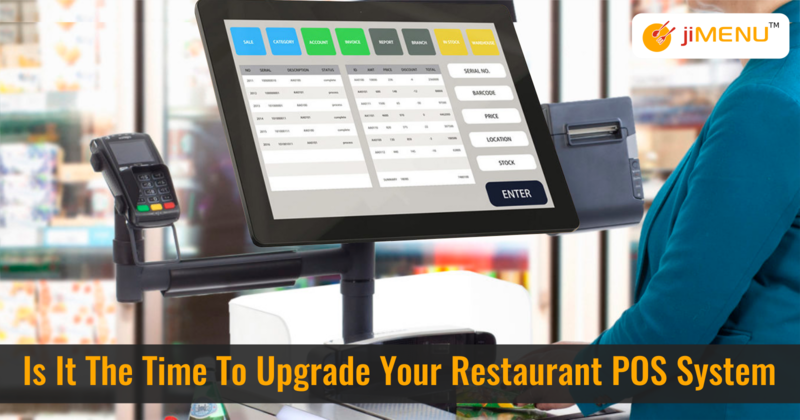 Generally, the POS start displaying some issues that help you know that it is the time to update your restaurant management software. Slow and Buggy Software: With advancement, people are becoming more impatient than ever before. This makes it more challenging for the restaurant manager to meet customer demand and to run their business smoothly. At such time, using an old POS system that becomes slow, buggy and complicated brings frustration for the manager, employees as well as for the customers. Making your customer waiting for too long makes them even more impatient and increases the chance of leaving without taking your services. It results in the loss of sales thus decelerating your business growth. Out-Of-Date Hardware: How many years passed since you are using your current POS hardware? Usually, the hardware devices tend to outmode after four to seven years. Also, new and updated software is not compatible with the older hardware system. The other factors that make the hardware outdated are older terminals, receipt printers, cash drawers that cannot accommodate the latest functionality of the tool. Limited Integration Capabilities: Do you work on multiple programs and spend maximum hours in exporting and importing valuable files? Constantly jumping from one program to another does not prove to be helpful, instead increases your daily tasks. Updating POS software helps you in managing all your back office tasks within one single platform. Also the tool help restaurant businesses in meeting the standard capabilities that your current POS might not able to cover. Unable To Process Modern Payment Options: Does your payment system has a chip reader? If not, then your system is out of date and fails to make transactions. Updating your payment system with the modern chip reader helps you in making a secure payment. Most of the customers refuse to use your services if your system does not use modern payment methods and system. So in order to keep your customer connected it is good to upgrade your payment process and using new payment gateways. Also, customers love to make easy transactions using their mobile apps like Apple Pay, Google Wallet, and Paypal. Introducing and accepting payment from such portals attracts more customer and hence proves to be beneficial for your business growth. Cost of Operating a Software: How much does your current POS system cost you? It is always good to choose the POS software that requires cheaper accessories, maintenance demands, and energy. Also, make sure that your current software does not require additional software to run smoothly. The updated software solutions are generally cheaper and offer a month-to-month rate. Also, the upgraded system prevents you, your employees and customer to save their time, energy, and prevents you from facing frustrations. So the basic reason for upgrading your POS system is to improve the effectiveness, reliability and integrating it with the new technology. Also, if you purchased the POS software in the initial phase of your business and with time your business needs increases then it becomes essential to look for the software that is able to meet your business requirements effectively. If you are running a restaurant then keep ready for regular upgrades and incorporate the required demand to take your business to meet new technological advancement. If you have confusion regarding your current system operation, then get in touch with us to avail the best advice and best system for running your restaurant business.